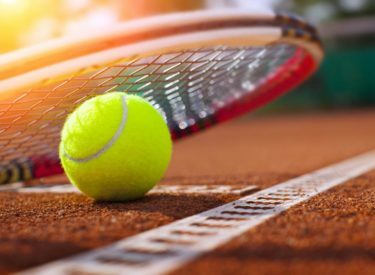 LIBERAL, Kan. – The third-ranked Seward County Community College men’s tennis team continued to roll with an 8-1 victory over No. 7 Cowley College on Friday at Blue Bonnet Park. The Saints, who have won eight of their last nine matches, improved to 11-5 overall. Both teams battled it out in less than ideal conditions with winds gusting throughout the matches. Seward started off by sweeping the three doubles matches and taking a 3-0 lead. All three matches were competitive, but Seward prevailed. No. 1 Gabe Nery and Sander Jans defeated Angelo Tost and Bruno Suiama, 8-5, No. 2 Nic Rousset and Nyathi Motlojoa ousted Killian Dagneaux and Nicholas Mougaillard, 8-5, and No. 3 Carlo Izurieta and Francisco Vargas knocked off Moises Sosa and Valter Oshiro, 8-6. The Saints continued to play well in singles competition. Again, the matches were extremely competitive, but Seward came out victorious, winning all but one contest. No. 1 Rousset beat Tost, 6-2, 6-3, No. 3 Nery defeated Mougaillard, 7-6, 6-2, No. 4 Francisco Vargas rallied to beat Oshiro, 3-6, 7-5, 11-9, No. 5 Carlo Izurieta ousted Dagneaux, 6-1, 6-0, and No. 6 Alex Mesquida Berg downed Moises Gonclaves, 6-1, 6-1. The only loss for Seward came in an exciting battle with No. 2 Jans falling to Suiama, 7-6, 2-6, 6-10. The Saints play at the Southwest Junior College Tournament on Friday and Saturday at Plano, Texas. Seward and Cowley battled it out in less than ideal conditions with winds gusting throughout the matches. The teams split the first two doubles matches with No. 1 Patricia Panta and Maria Aveiga beating Takalani Molaoa and Georgina Kaindoah, 8-4, and No. 3 Alisa Handrugan and Eva Liu losing Margot Fontaine and Coraline Lamer, 4-8. No. 3 Alena Macharova and Sofia Belluco against Mariana Rodriguez and Aletta Macheli. Macharova and Belluco fell behind early, but rallied for the 9-8 victory. Seward started off strong on the singles side taking a 4-2 lead on victories by No. 2 Aveiga and No. 3 Macharova. Aviega beat Allana Molnar, 6-2, 7-6, while Macharova defeated Macheli, 6-2, 6-4. That would be the only matches the Lady Saints would win the rest of the way. The Tigers came back and won the next four matches to score a 5-4 victory. No. 1 Panta lost a tough battle with Molaoa, 6-2, 3-6, 8-10, No. 4 Belluco fell to Kaindoah, 1-6, 4-6, No. 5 Handrugan was defeated by Fontaine, 0-6, 6-7, and No. 6 Liu lost to Lamer, 4-6, 2-6. The Lady Saints play at the Southwest Junior College Tournament on Friday and Saturday at Plano, Texas.